The MAD House creative mission stems from a singular goal of making sure the client’s brand stands apart from all competitors. We deliver breakthrough branding, advertising and graphic design. The MAD House Building Brands that Bring Enjoyment to Life. All types of decorated apparel & promotional products from tshirts, caps, polo shirts, jackets, cups, tote bags, pens and much more. Silk Screening and embroidered. 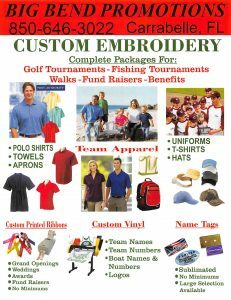 Locally owned and operated Big Bend Promotions can help you with Custom Embroidery / Custom Vinyl for Golf or Fishing Tournaments, Fund Raisers or other events and clubs. Give Judy and David a call today 850-646-3022.